In the United States, about three out of every 10 plant species is threatened. Scientists predict that as more information and knowledge about plant populations around the world is gathered, this number will increase dramatically. Recognizing the importance of contributing to local, national and worldwide plant conservation efforts, the U.S. Botanic Garden participates in collaborative partnerships and programs to conserve threatened plants, share information about the threatened flora of the world and teach others how they can play an active role in plant conservation. 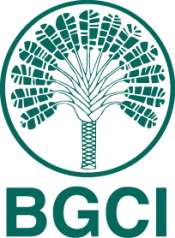 The Garden is a member of Botanic Gardens Conservation International (BGCI) and has registered to support the International Agenda for Botanic Gardens in Conservation. The U.S. Botanic Garden grows more than 500 rare plants and has collaborated with BGCI on the Care for the Rare project, a free resource for gardens to communicate conservation stories of threatened plants in their collections. 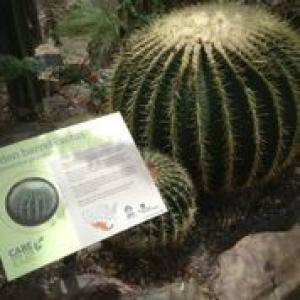 Some endangered plants on display in the Conservatory, such as the golden barrel cactus (Echinocactus grusonii), feature these signs to educate visitors about the story of each plant and how they can help care for these rare plants. Orchids are found throughout North America and many of the approximately 200 species are threatened or endangered because of habitat loss. The North American Orchid Conservation Center (NAOCC) is a collaboration between the Smithsonian Environmental Research Center and the U.S. Botanic Garden that will join public and private organizations to conserve, cultivate and restore North America's native orchids. The Convention on International Trade in Endangered Species of Flora and Fauna (CITES) is an agreement among most countries of the world to document and regulate international trade in specimens of wild animals and plants to ensure that uncontrolled trade does not threaten their survival. Occasionally, plants transported across international boundaries without required CITES permits are confiscated by border authorities. If plants cannot be sent back to their country of origin, they are placed into a Plant Rescue Center, which agrees to maintain and care for them in perpetuity. The United States Botanic Garden is one of 62 botanical gardens, arboretums, zoos and research institutions that participate in the Plant Rescue Center Program. The Plant Rescue Program was established in 1978 by the U.S. Fish and Wildlife Service, the agency in charge of implementing the requirements of CITES in the United States. Hundreds of protected and threatened plants, mostly orchids and succulents, have been accepted into the USBG collections through the Plant Rescue Center Program and used for conservation and education programs. For an example of how the USBG contributes to plant conservation using plants obtained through the Plant Rescue Center Program, read about our Paphiopedilum vietnamense Orchid Conservation Program. Only 39 percent of endangered plant species are currently protected in collections at public gardens. The North American Collections Assessment - conducted collaboratively by Botanic Gardens Conservation International (BGCI), the U.S. Botanic Garden and the Arnold Arboretum of Harvard University - is the first consolidated list of threatened plants in North America. 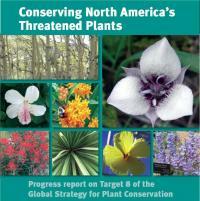 Read the full report, Conserving North America's Threatened Plants: Progress report on Target 8 of the Global Strategy for Plant Conservation. These results are critical to helping the botanical community prioritize the development of conservation collections for threatened species not yet in genetically diverse and representative collections. Assessment recommendations will enable public gardens to better understand their individual contributions to preserving plant diversity and place those efforts within a global network.